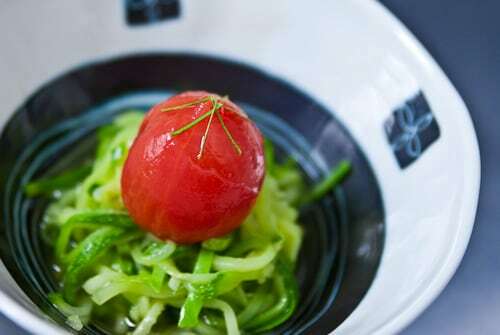 Poached tomato served chilled with noodles made from zucchini makes for a refreshing summer appetizer. Vegan, gluten free and delicious. Summer has officially hit New York like a raging inferno. With temperatures soaring into the 90’s and humidity to match, my appetite to cook has all but been snuffed out. This chilled poached tomato dish involves a day of waiting, but the prep time is minimal, and the cooking time is so short your apartment won’t have a chance to heat up. If you’re thinking that tomatoes and zucchini sound a bit dull, I’d normally agree with you, but this is one of those transformative dishes that takes ordinary ingredients and produces something otherworldly. The sweet summer tomatoes, which are naturally loaded with umami are infused with an extra boost of flavour from the vegetarian dashi they’re poached in. After a soak overnight in the broth, they’re rendered plump, juicy and brimming with lip-smacking umami that will have you grinning like a vegan tasting bacon for the first time. The chilled zucchini does an admirable job mimicking soba noodles in shape if not in color. Finally, the whole thing is doused with a light sauce made from the poaching liquid and garnished with some thin strips of kaffir lime leaf. As a dish, it’s colourful and refreshing with a nice combination of textures, and if you feel like you’re apartment’s been turned into a Turkish Hamam by the heat, this will surely lower your core temperature by a few degrees. Add the water, kombu and salt to a bowl and let it soak overnight. Find a pot that's just big enough to hold the tomatoes in one layer, but don't put the tomatoes in yet. Discard the kombu and add the liquid into the pot and bring to a boil. Dunk the tomatoes in for a few seconds making sure to roll them around a few times. This loosens the skin and makes it very easy to peel the tomatoes. Transfer the tomatoes to a bowl of cold water and peel each tomato. When all the tomatoes are peeled, bring the pot of stock back up to a boil, then turn off the heat. Put the peeled tomatoes in the pot and cover with a lid. The tomatoes will gently poach in the liquid as it comes back down to room temperature. When it reaches room temperature, gently transfer the tomatoes to a container and pour the stock over them. Seal and refrigerate overnight to allow the tomatoes to absorb the flavor from the broth. The next day, drain off 1 C of the poaching liquid from the tomatoes and pass it through a tea strainer into a small saucepan. Whisk in the cornstarch and soy sauce then bring to a boil. The sauce should become clear and thicken just a little (it will still be very loose). Put the pot in a water bath to bring the sauce back to room temperature then put it in the freezer to chill. For the zucchini, bring a large pot of heavily salted water to a boil. Cut the top and bottom off of the zucchini then slice it lengthwise down the middle. Use a spoon to scrape any seeds out. Use a mandoline or a sharp knife to slice the zucchini into long noodles. Prepare a large bowl of ice water. When the pot of salted water reaches a rolling boil, add the zucchini and stir for a few seconds. The zucchini should be wilted but slightly crunchy still. Drain the "noodles", and dump them into the ice bath. Squeeze some of the excess water out of the noodles with your hands and transfer to a bowl. Refrigerate to chill. To serve, just lay down a nest of zucchini noodles in a decorative bowl and top with 1 poached tomato. Drizzle on sauce and sprinkle a few threads of kaffir lime leaf on top. Marc that picture is fantastic! I’m loving your recipe too! looks like very nice flavors for a minimalist summer dish, good luck beating the heat! Welcome to my world! The temps here haven’t dipped below 90 degrees in months! The last thing I feel like doing is cooking. Love this dish, though. A perfect way to “beat the heat”. There’s nothing dull about tomatoes and zucchini there! Kaffir lime leaves sounds like a really nice addition. Very refreshing and looks delicious! The photo is absolutely stunning! There is no harsh reflection on the tomato, I’m very impressed. Wow, Marc–sometimes it’s those simple dishes that are so stunning. Fabulous; it would never have occurred to me to poach a tomato. I love how you keep coloring outside the lines! Nice refreshing recipe – love it! How refreshing does that look! And its colors are so beautifully-vibrant that I would probably hesitate to dig in, but not for long. awesome. Very blog forward. you turned a potential low-carb tainted post into something explorational. sweet. I love the simplicity of this dish, which marvelously shows off its two main ingredients — a tomato and zucchini. It has a lovely Japanese sensibility and naturalness. This looks great, and I’ve been preparing it this weekend for a dinner party on Monday. Were the lime leaves fresh? I can only find dried. If so, could I still use mine or just leave them off?